Is everything in Mathematica ultimately stored as a rule? My current understanding about Mathematica is that everything, at the lowest level, ends up as replacement rules. First question: is this true? Second question: does Mathematica "gloss over" these rules by representing them as functions? doesn't seem to be expressed as a rule. Third question: does the by value/by reference question have any when you "pass" a value to a Mathematica function? When you define a function f, you are (a) applying Set or SetDelayed to a pattern, (b) creating a rule, (c) associating the rule with a symbol (f), and (d) storing that in DownValues (usually). First question: is it true that "everything in Mathematica is ultimately stored as a rule?" No: for example 2 is not a rule. It's just 2. So not everything is a rule, just functions. Everything is an expression, ... some expressions (as a side-effect) create and store rules in DownValues. Second question: does Mathematica "gloss over" these rules by representing them as functions? If you want to see the definition of f you should either use Information (which is glossy and not very useful) or DownValues which contains what you're after. Work on the assumption that Mathematica is pretty smart "under the hood" about pass by value/ pass by reference. Not the answer you're looking for? Browse other questions tagged functions replacement core-language or ask your own question. 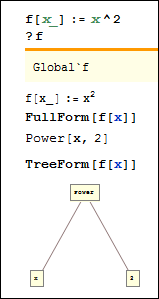 Can we say that “all functions in Mathematica are some kind of pattern-matching-and-replacement procedures”? What is the difference between Reduce and Solve? How do I write a function that can be used in a rule to modify both sides of an equation? Why evaluation doesn't fail if arguments are invalid? How do I encode this replacement rule?